Acacia Sim's wattle blossom comes from the Greek ακις (akis) , a thorn or spike; simsii is for 19th century British physician and botanist Dr. John Sims (1749 – 1831), who took over the editorship of the Botanical Magazine after the death of William Curtis (1746 – 1799), its founder. The magazine first appeared in 1787 and was produced, according to Curtis, in response to the “repeated solicitations of several ladies and gentlemen for a work in which Botany and Gardening, or the labours of Linnaeus and Miller might happily be combined.” Its beautiful hand-coloured plates made it very desirable and it achieved a circulation of around 3,000 throughout Curtis's lifetime. It showed ‘The most Ornamental Foreign Plants, cultivated in the Open Ground, the Green-House, and the Stove, are accurately represented in their natural Colours.’ It also included ‘Their Names, Class, Order, Generic and Specific Characters, according to the celebrated Linnaeus; their Places of Growth, and Times of Flowering: together with the most approved methods of culture .’ The magazine was ‘Intended for the Use of such Ladies, Gentlemen, and Gardeners, as wish to become scientifically acquainted with the Plants they cultivate’. Curtis’s Botanical Magazine is still in publication (by the Royal Botanical Gardens, Kew), although the hand-colouring of the plates was discontinued in the late 1940s. seed pods Sims' Wattle is rather a scraggly shrub generally found growing along roadsides. The one photographed is by the side of the West Point road. It is fairly widespread, occurring in the Gove area of the Northern Territory and on the edge of the Barkly Tableland, in North Queensland from Cape York south almost to Mackay. 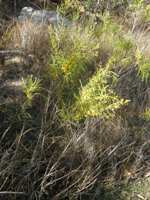 It is found on gentle slopes and plains in coastal areas, and inland on gently undulating terrain. It usually grows in sand and gravel in eucalypt open forest and woodland, sometimes in closed heath on the Cape York peninsula, and sometimes forming closed scrub in disturbed areas. It has narrow lime-green phyllodes from 5 – 14 cm long, linear to narrowly elliptic, straight to incurved, and less than 1 cm wide, and a very showy display of bright yellow flowers in heads. The inflorescences are simple, or rudimentary 1- or 2-headed racemes with axes less than 2 mm long, normally occurring as an axillary group of heads. The flowers are globular, up to about 5 mm in diameter, unlike most of the other wattles on the island that have catkin-like blossoms. The seed pods are linear, straight-edged to shallowly constricted between seeds (occasionally, deep constrictions can occur), flat, but raised over the seeds alternately on each side, up to 8 cm long, about half a centimetre broad, glabrous. The seeds are longitudinal, broadly elliptic, 2.5 – 4 mm long, dull, brown-black, with a club-shaped aril. This wattle was one of those whose seeds were used as ‘bush tucker’ by the Aboriginal peoples. Roasted and ground they produce a powder that has a nutty coffee-like flavour.